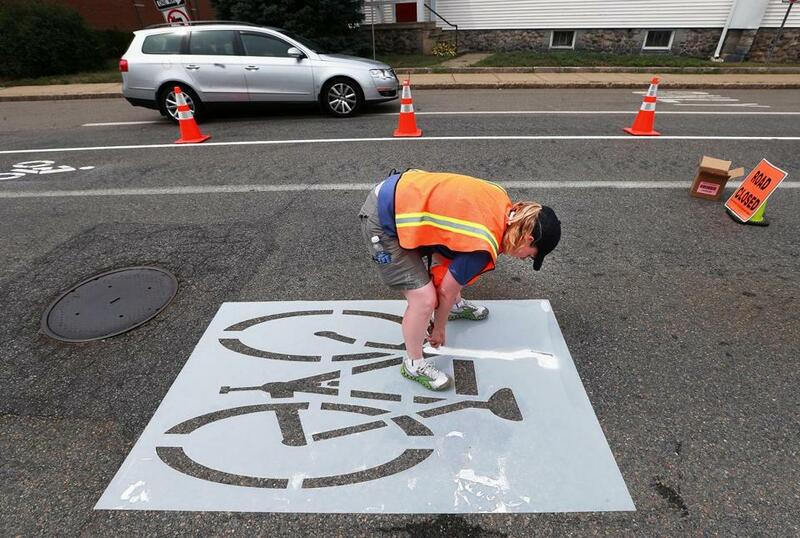 Sarah Lee painted a sign on a temporary bike lane on Maynard’s Main Street this summer. 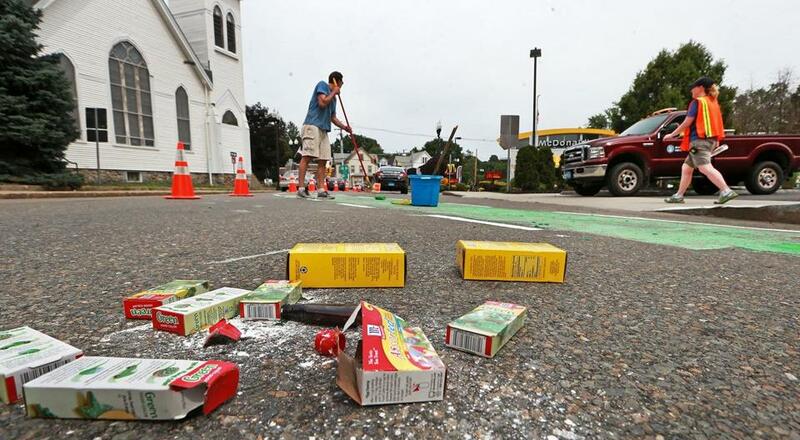 Armed with chalk paint, tape, cones, flowers and a piece of artificial turf, town planners recently set out to reconfigure and beautify several streets in downtown Maynard. Within just a few hours, officials from the Metropolitan Area Planning Council put in new bike lanes, extended curbs, and even installed a miniature green space called a parklet. But a few days later, all signs of the changes were gone. The temporary road installation was a new technique gaining popularity among planners to test out changes to roadways, sidewalks and intersections without spending thousands or millions of dollars. 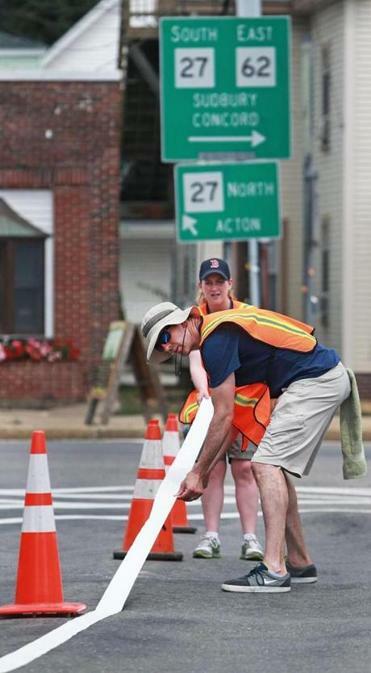 Barry Keppard (front) and Sarah Lee worked on laying down tape for a temporary bike lane in Maynard. Christopher Kuschel, a planner with the MAPC who oversaw the Maynard installation, said projects are typically studied, designed, and then built — all without knowing for sure whether they will work. Maynard, Lexington, and Newton are among area communities that recently installed temporary street installations. While Maynard and Newton’s test lasted just a few days, Lexington plans to keep its temporary installation up for about three months. James Freas, deputy director of Newton’s Department of Planning and Development, said the city decided to explore the idea after a redesigned intersection was not well received after construction. In June, the city tried out specific ideas such as new bike lanes, sidewalk bump-outs, and a parklet in the area of Washington and Walnut streets. The main point of the project, however, was to find out if residents liked the idea of temporary street installations in general to help guide future transportation projects. “One of the advantages is that it really gives people a chance to visualize what it is we’re proposing to do in an area and get comfortable with it before we sink significant dollars into it,’’ Freas said. Freas said officials used chalk paint to make new bike lanes and crosswalks, lots of cones to reconfigure streets, and message boards to alert residents. The installation was set up between 9 p.m. and 4 a.m., and in place for a Friday and Saturday. City staff were on hand during that time to answer questions, and a camera was running so officials could review how traffic patterns changed. Freas said the city is putting together a comprehensive transportation strategy and will probably recommend using the installations for future projects. John Livsey, Lexington’s town engineer, said officials are considering major changes to the downtown area so they thought a pilot would be a good way to get community feedback. Livsey said the town has tested out small changes, such as using cones when extending a curb to make sure fire trucks can still get around, but this is the first time for a major project. The Lexington project has three major components, all of which involve removing travel lanes, Livsey said. The test removes a right-turn-only lane at Waltham Street and Massachusetts Avenue heading east, and a right-turn-only lane heading west at Edison Way and Mass. Ave. In both cases, the dedicated turn lane will be gone but cars can still turn right. Livsey said the curbs would be bumped out and sidewalks extended to allow for better pedestrian access. The third change is going from two lanes to one on Harrington Road near the Battle Green as a way to improve safety. The changes are expected to be in place another two months, but could be less or more depending on feedback, Livsey said. Kuschel said the minimum time for an installation should be a week, but the longer the better so drivers have a chance to get used to the reconfigurations. In Maynard’s case, Town Planner Bill Nemser said the town was able to identify aspects of the project that residents liked – parklets and curb bumpouts, for example — and didn’t like – a bike lane on Main Street. Nemser said neither drivers nor cyclists liked the proposed configuration for cars, bikes, and parking. In addition to Lexington, Maynard and Newton, Kuschel said Natick and Boston have done small projects to test changes. “I would expect there to be more of these now that we’ve seen a few of them,’’ he said. Because of the temporary nature of the project, real paint was not used to color a bike lane green. Instead, it was a mixture of corn starch and food coloring.